I was quite productive today, despite the fact that I couldn’t sleep last night. It’s been awhile since I had such a sleepless night, and if it’s gonna happen, a Friday night is the best time. So I can’t really complain about that. I got up about 8:15 and made coffee. Then I put some clothes on and set my timer for 15 minutes, and started straightening up in my room. Then 15 minutes in the kitchen, and then the living room. Then a vacuum and mopping session on the floors. Then I did yoga. I got to thinking that yoga might be good for my neck, shoulders and back. I order movies from Netflix, and wondered if they have yoga dvd’s. Well, they do. I ordered one called Yoga Wisdom for Neck Pain & Tight Shoulders. I really like this one, and do think it is helping. My massage therapist seems to be making some good progress on the tightness around and under the shoulder blade. I’m crossing my fingers. After a bite of lunch, I loaded the memorial quilt top. 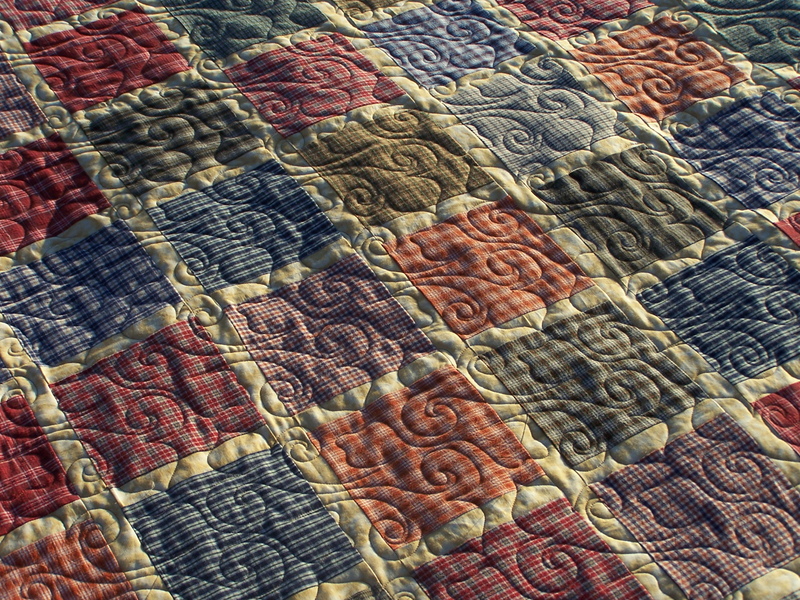 I quilted it a panto named Joust, by Willow Leaf Studios. I love the way this turned out. I think the family will be pleased. Next step is to make the binding. I am going to make it from the boy’s shirts, also. I received this beautiful charm pack in the mail this week, from OzJane. She did a blog giveaway, and ended up sending out charm packs to everyone. How very generous. She couldn’t have picked a more perfect pack for me! One of my best friends, who recently moved away, was back in town two or three weekends ago. Look what she brought me. She found it in an estate sale for $1.00! Still in the box, with the tag. The owner of the Wizard of Oz quilt has been out of town, and didn’t get to pick it up til this week. She loved it, and so did her husband. She also gave me a king size Turning Twenty Again top to quilt for her. And my instructions are to just have fun and do my thing all over it. Woohoo! A freehand allover from the front. I’m looking forward to getting to it. It will be my first with wool batting. 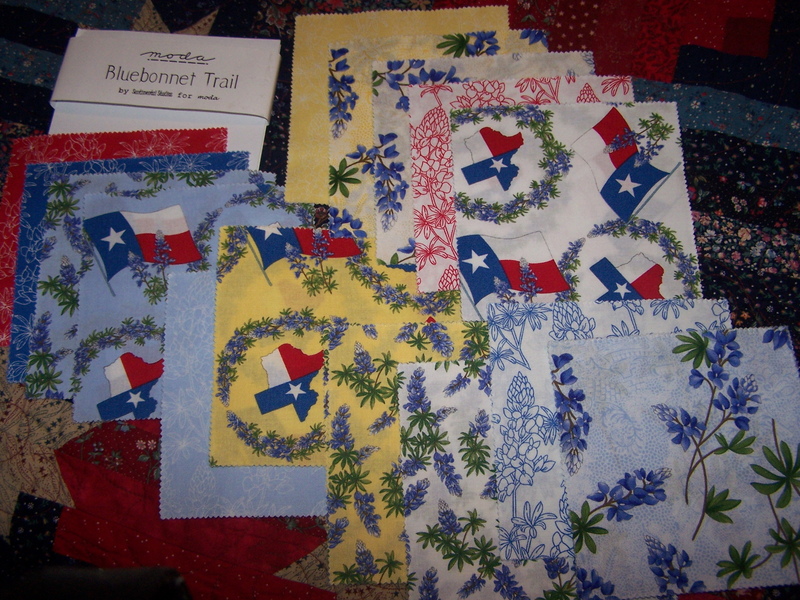 I have some on order from Quilter’s Dream, and she has a FatBack ordered from Christian Lane Quilters, for the backing. I joined the local guild Tuesday night. I went to their first meeting of the new year. I’m looking forward to it. I hope I can manage to find time for the projects. I hope tomorrow will prove to be another productive day. If it isn’t, I won’t have much of a stash report…lol. The quilt is perfect Randi. Glad the yoga and massage is helping your pain. AND very glad you were not near where IKE did his thang! You have been busy! I really like that panto. I don’t buy many pantos but I like ones that have good overall texture. I might need that one! 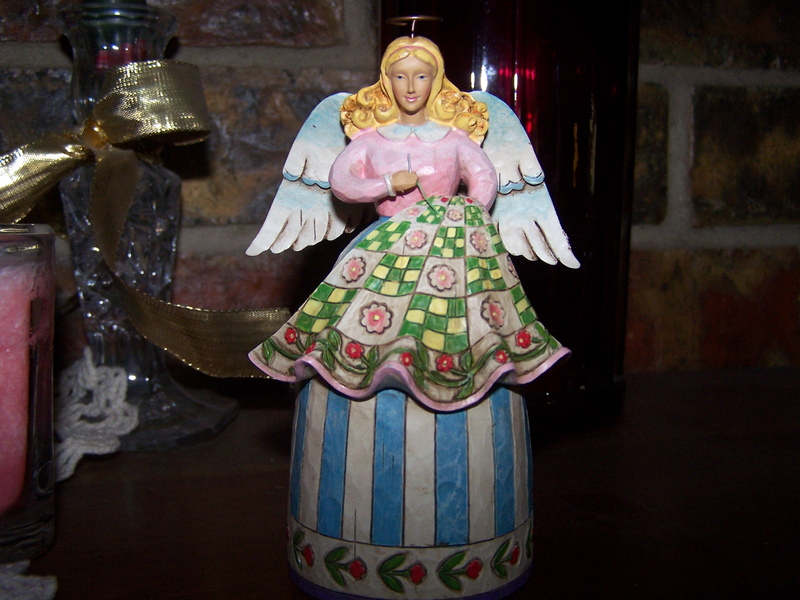 Your quilting Angel is way cute! Hope it helps keep the tension devils away! Randi, I love the memorial quilt and I’m sure the family will as well. The angel will bring good energy and karma to you while you enjoy your yoga; glad it seems to be helping. Have you ever considered Reiki? Wish my day had been half as productive as yours, maybe tomorrow. Glad you are safe, take care. That quilt is absolutely gorgeous. 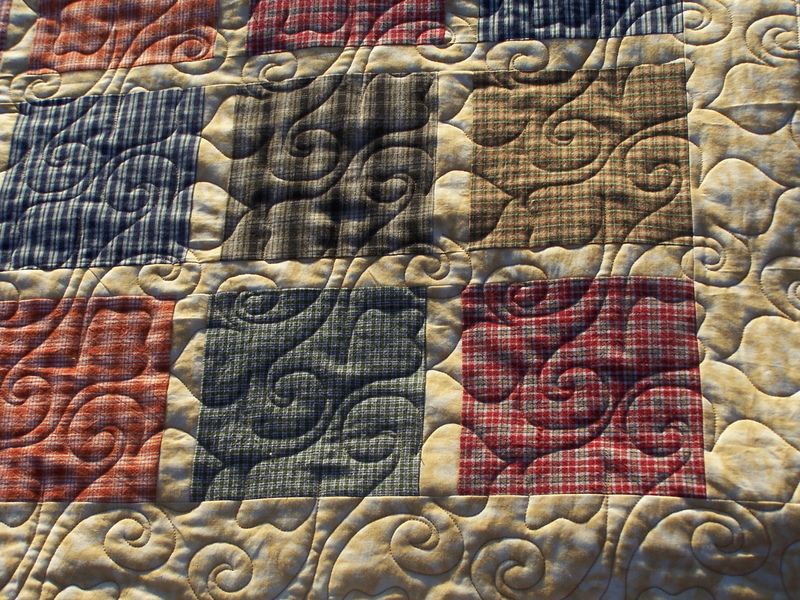 I love the quilting you have done on it!!! I am glad to hear that you had a productive day. Those productive days sure make one feel GOOD, don’t they? I hope you get to enjoy the rest of your weekend. 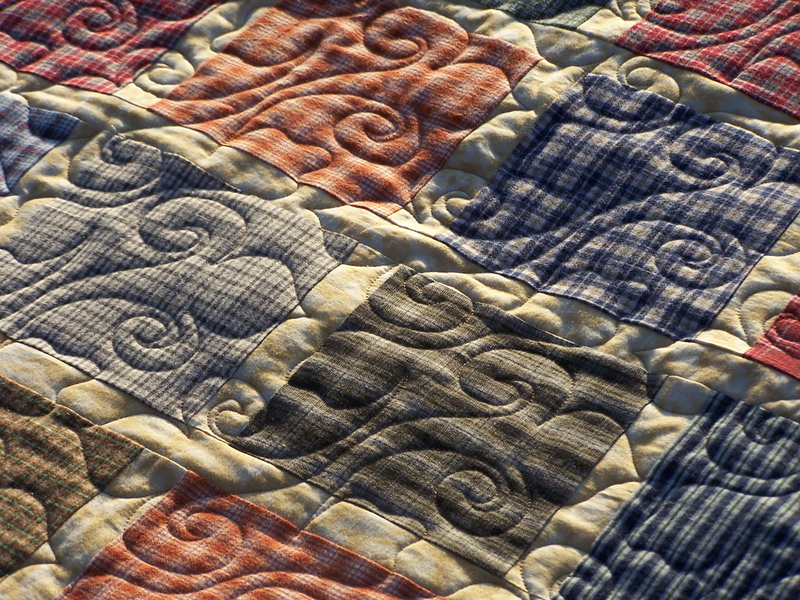 The memorial quilt looks lovely, I’m sure the family will be pleased. I’ll have to check out that pantograph, it gives the quilt wonderful texture. I honestly don’t know what a panto is, but I really like the quilt you show at the top of this post. The colors are wonderful! Just found your blog and am enjoying what I’ve seen so far. Do you quilt tops for other folks? I had a friend who did this, but she has had to stop for health reasons.